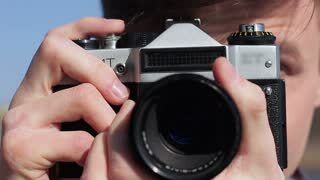 The photographer works with the old camera. Cover with a cape and take pictures. Broadcast basketball. Playing basketball in the viewfinder of the camera . A cameraman shoots a camera broadcast. Close-up from the back, the camera is out of focus. 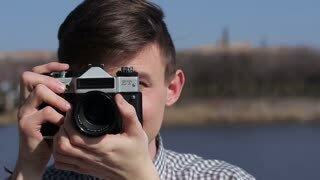 A hand reaches in to lift then close the viewfinder on a vintage Polaroid Land camera. Extreme close-up. 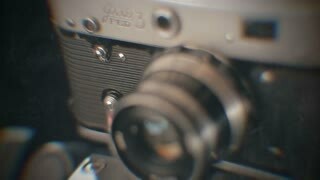 Macro shot of mechanism on a Polaroid Land camera. Rack focus, HD. 1960s: tarantula spider walks on green floor. spider web glistens with water. man adjusts instruments and controls on telescope and checks viewfinder lens. stars sit in darkness of space. Professional Photographer climbing up to a dune, to get the perfect shot. African Girl Adjusting Her Camera Before Leaning In To Snap A Picture.